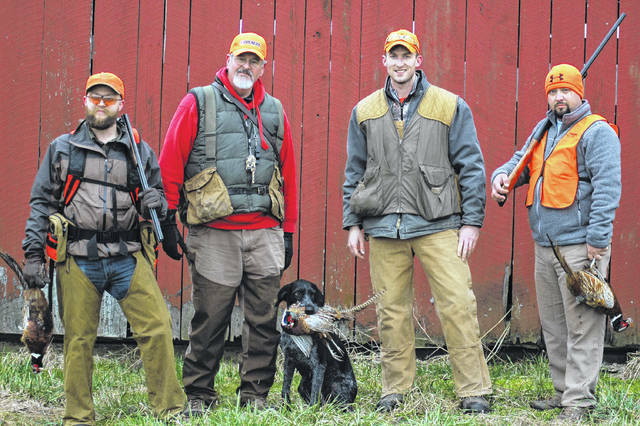 From left are Braeden Windham, Steve Kane, Nick Shale, and Wes Corbin with Lizzy the dog and their harvest for the morning. Braeden Windham took a quick shot at the first pheasant of the morning, making quick work of the bird with a clean shot. 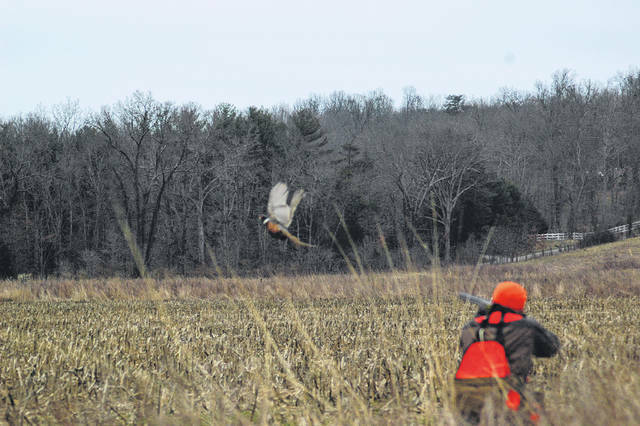 McKean’s Pheasant Farm opened two fields for two groups of hunters to work simultaneously, enabling a safe and efficient hunt for the veterans. GALLIA COUNTY — Veterans gathered together Saturday at the Elks Farm on Ohio 588 for the fourth annual Heroes Tribute Hunt, a special event for veterans. The event is sponsored and coordinated by the Appalachian Valley Chapter of the North American Versatile Hunting Dog Association (NVHDA), which wanted to give back to veterans and introduce them to the hunting dog sport. 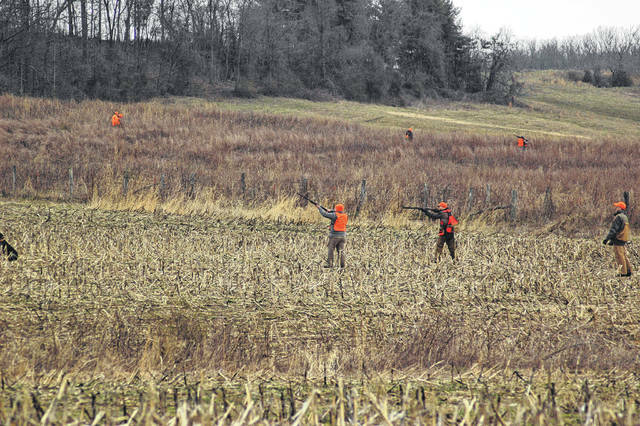 NVHDA funds the event through a grant from the Ohio Department of Wildlife (ODW) and Ohio Department of Natural Resources (ODNR) to provide for 24 veterans to hunt pheasants with trained dogs. Kane brought out his dog Lizzy, who flushed out four birds for two hunters, Wes Corbin and Braeden Windham. Corbin, born and raised in Gallia and Windham of Anna, Ohio both participated in the hunt for the fellowship and camaraderie that is intrinsic to the day. “The camaraderie is a big part, to come out and spend some time with some other vets, get out and hunt, and to have a good time,” said Corbin. “I think Wes hit the nail on the head there. It’s good to get out, be outdoors and do things we like doing,” said Windham. Together they harvested three pheasants, with the fourth being too close to the road for a safe shot. Veterans were taken out in different groups during the day, with each getting the chance at five birds. McKeans Pheasant Farm worked with the Heroes Tribute Hunt by providing the birds and the land for the hunt. Before each group was sent into the field they would release five birds. Small groups of hunters would be led out in the field with a handler and a hunting dog, a spotter, and the occasional photographer. One of the volunteers with Windham and Corbin was Nick Shale, a conservation wildlife biologist with the state of Ohio. Multiple local groups came together to make the day possible. The Elks farm provides their grounds and shelter house, and the Gallia County Conservation Club volunteers brought in the National Archery in the Schools Program and the Passport to Fishing Program. The Athens ODNR allowed the use of their trap thrower and the Gallia Shooting Aces 4-H club ran the trap shooting area. Gallia Soil and Water brought in its Furs and Skulls program to exhibit. The Emblem Club catered breakfast, lunch, and dinner, and Bridgeport Equipment rented two utility vehicles at no cost for the day. The application for next year’s grant has already been submitted and plans are in place for a fifth annual Heroes Tribute Hunt. The group operates a Facebook page to let the public know about their events and and news, which can be found by searching Heroes Tribute Hunt.